Young men and women make rude and insensitive comments everyday. The military is no different, however, if serious, some comments or gestures could end your military career. However, to convict a service member under Article 117, prosecutors must prove that the accused used words or gestures toward another service member which were harsh enough to warrant an altercation or a "breach of the peace". Proving that the comments or gesture a service member made warranted the physical altercation following the comments is difficult. In fact, often both members will be in trouble regardless of who started the altercation through words or actions. It depends on how you define "provoking speech or gestures." What basically comes down to bullying, joking with personal cruelty or insensitivity (whether spoken or gestured), or other language that makes a fellow military member extremely offended or angry, could fall under the UCMJ Article 117 - Provoking Speeches or Gestures. What Is the Maximum Possible Punishment for Article 117: Provoking Speeches or Gestures? This article is no joke. Lacking the discipline to control your words and actions toward each other is a serious character flaw that the chain of command will take very seriously. A disruption to the morale and personal welfare of the unit will always be dealt with in a serious manner. Is the Article 117 difficult to prove? How does the military define “Provoking Speech”? The service member being provoked must be present at the time of offending service member speaking. The speech is inflammatory enough to lead a reasonable person to cause a breach of peace, whether through aggressive actions or additional verbal attacks. 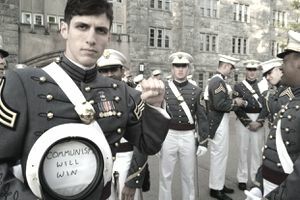 Additionally, the military does not consider provoking speech to include reprimands, censures, or reproofs which may be used in the interests of training, efficiency or discipline of the armed forces – as done in training or military indoctrination programs. (3) That the person toward whom the words or gestures were used was a person subject to the code. (1) In general. As used in this article, “provoking” and “reproachful” describe those words or gestures which are used in the presence of the person to whom they are directed and which a reasonable person would expect to induce a breach of the peace under the circumstances. These words and gestures do not include reprimands, censures, re-proofs and the like which may properly be administered in the interests of training, efficiency, or discipline in the armed forces. (2) Knowledge. It is not necessary that the accused have knowledge that the person toward whom the words or gestures are directed is a person subject to the code. Most of the time, an altercation between two military members will likely not escalate to a UCMJ offense, but Non-Judicial Punishment for fighting regardless of the instigator will typically occur. There are also other ways to deal with this type of disturbance within the ranks that will not require any official punishment. Senior Enlisted Leaders have other ways to deal with two people that do not get along with each other - make them rely on each other for everything as well as be punished together and other creative ways to deal with tempers in the military. Sometimes, handling these type of infractions internally will work. If not, there is always the Uniform Code of Military Justice approach.